You’re not alone. It’s how our brains work. In order to “know” what we see, we need to have seen it, or something similar to it, before. It’s easy to recognize a mountain, because, well, you’ve probably seen a mountain a million times before. But would you recognize a close-up of the face of a butterfly? Point is: sometimes words are important to complement a picture. And as it turns out, pairing visual and verbal information will not only allow us to more easily understand the picture, it also makes us more likely to recall the information we just learned at a later occasion. This powerful combination of words and visuals is what makes Exposure such a great storytelling tool. If you haven’t seen this visually striking platform yet (it launched last year), you should really check it out. With an emphasis on the imagery, it sets you up for some very dynamic storytelling. Although it may be easy to fall for the temptation and post a myriad of photos from your smartphone, take a moment to scroll through these Exposure stories below and think about how the commingle of photos and narrative can make for some great storytelling. 1. Have a good story to tell. It may seem obvious, but actually having a story to tell if you want to get the most out of Exposure is important. Very important. Now, we don’t need to get all fancy. The story of a high school Waiting for the President is genius in its simplicity, ringing familiar bells with Breslin’s story about Clifton Pollard, the gravedigger who dug JFK’s grave. 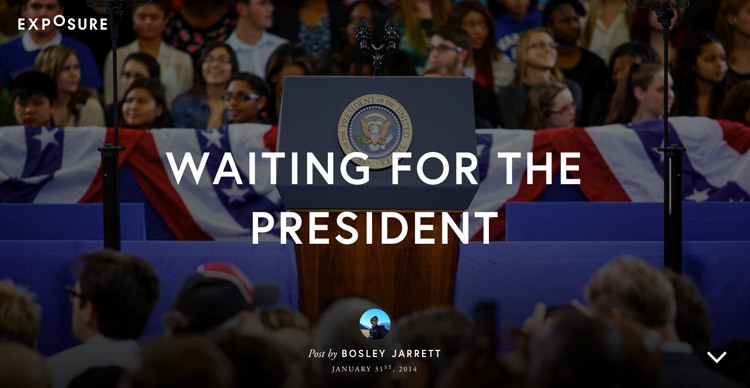 Waiting for the President has the immediate scroll effect, an essential effect if you want the world to hear (see, read, whatever) your story. 2. Short is sweet. Empowering Women Globally is a good example of a story not made longer than it needs to be. In fact, the longer you keep going, the harder it will be to keep your viewers until the end. Empowering Women Globally has just a few powerful photos and short sentences of text. That’s it. In short – the shorter, the better. See what I mean? Okay, I’ll stop here. I think I made my point. 3. Follow a narrative arc. Think about how you want to tell your story. Have a common thread, and keep to it. Sentinel Dome I uses something as simple as time to keep the viewer in the loop. Another thing worth noting with this Exposure story is that the destination is not the point of the story, it’s the journey there. Keep this in mind; sometimes all the hard work that went into a project is worth emphasizing more than the final product itself. 4. Make it fun to watch. 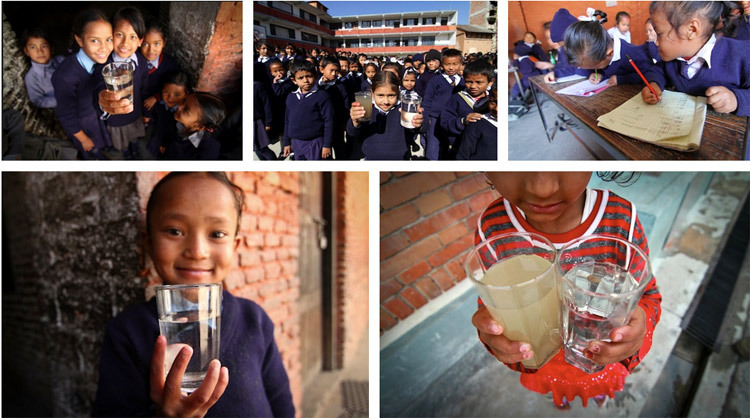 Refills for Everyone, from our friends at Charity:Water, has a great variety of photos, laid out in several ways. Different sized images are presented in a playful manner. Smiling kids alternate construction and close-ups of spurting water. 5. Let the text tell the background, and the photos the result, like in this beautiful example of Migrant Song. Finally, as a last piece of advice: spend some time finding the right photos to tell your story, and leave out the ones that keep the story from moving forward. The photos don’t all have to be of Elliott Erwitt caliber (although that would be nice, wouldn’t it? ), but they definitely should be of high quality. Better yet, if the photos stir up an emotion or two, you can be sure your story will be remembered. Also worth noting: Non-profits can be eligible for free subscriptions. Standard subscriptions are available from $5/month. Have you used Exposure, or seen it used well? Tell us your experience in the comments section below.